Have you relied on sales people from mail order services or department stores for technical advice on your selection of an air purifier? Do you feel they are thoroughly versed in the technology of the machines they were selling? Or were they learning about the product along with you? Ninety percent of the pollution in the air is invisible. How will you be assured that the air cleaner you purchase does the job?? The members of our sales staff are trained in the technology of air cleaning & purification and many of them have college degrees in technical disciplines including engineering. You can be assured that when you seek their advice you are receiving an honest, competent recommendation. They know that the actual effectiveness of an air purifier depends on a variety of factors, including the amount of air that the air purifier processes, the nature of the pollutant, and the rate at which the pollutant is being introduced into the environment. 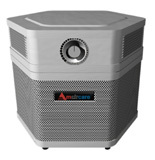 Purchase from us with assurance that we are recommending the best air purifiers for your circumstances. We offer high quality products that get the job done better than most other products in their class. Spending less may not be a bargain after all, because you may not be buying the protection you really want, need, and deserve. You're worth it! It's time to take action. Click on "BUY" button for orders. Austin Air has assembled a filter to trap the allergens caused by pets. 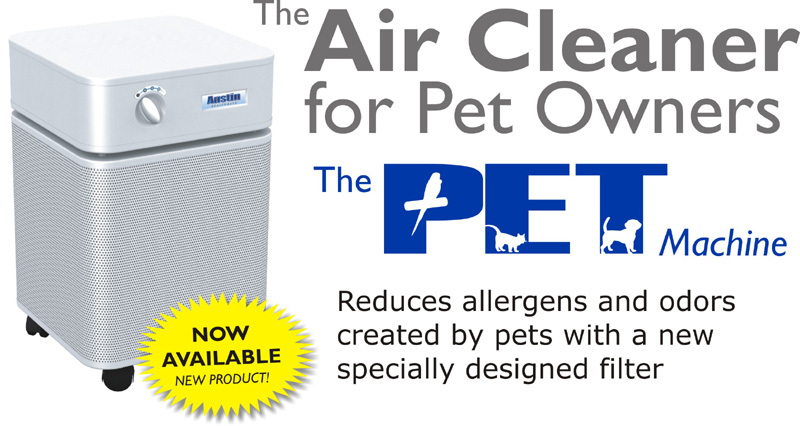 The Pet Machine uses HEPA technology to trap airborne dust and dander. While the Special carbon blend will help reduce many pet odors that linger in the air. Click Here for More Information about The Pet Machine or see below for pricing and ordering. Up to four stages of air filtration, high delivered airflow, good mechanical seal around HEPA filter to prevent air bypass, all metal housing to avoid vapors from plastics, variable speed motor, motor out of airflow, independently replaceable filters. Optional UVGI & Hi-C carbon weave filter available. Five stages of air filtration, high delivered airflow, good mechanical seal around HEPA barrier post filter to prevent air bypass, all metal housing to avoid vapors from plastics, variable speed motor, motor out of airflow, independently replaceable filters. Bulk refillable carbon canister may be user refilled. Click for FAQ best overall protection, HEPA & VOC module independently replaceable, high efficiency motor, lasts longer2. If the product you want is not on this chart try our secure online store or site map. Click Here for Portable Air Purifiers Replacement Filter Prices or find air purifiers of interest in online store and see 'related items' section. Shipping rates to Continental U.S.A., for other destinations please contact us. In the event machine is returned, a credit will be issued less shipping to send unit to customer. *** 8 ft ceilings. For other heights multiply these areas by 8 and divide by your ceiling height in feet. ACH = Air Changes per Hour. CFM = Cubic Feet per Minute delivered air processing rate per machine with 60 Hz power. ACH depends on the volume of the room and CFM of the air purifier. We recommend about 6 ACH in a typical office or residence for light air contamination and to generate enough circulation to reach the corners of the room. If you have sources actively emitting pollutants into the ambient air of the room (such as cigarette smokers) than you may need enough air cleaners to obtain 8 or 10 ACH, for moderate to heavy pollution, depending on the emission rate of pollutants. The Capacity column in the table indicates the area with 8 ft ceiling that the air cleaner will properly clean vs. ACH. If your ceiling height is different than 8 feet, multiply the areas (sqft) indicated in the table by 8 and divide by your actual ceiling height to estimate the correct area per machine in your facility. If the area of your facility is larger than the capability of a single machine, you may need to provide additional machines. In the event that you require numerous portable machines to adequately process the air then you should consider higher capacity ceiling mounted air cleaners found in our commercial section or possibly central air cleaners. In some cases you may need industrial air cleaners. Also see the sizing table here. Contact us with inquiries. **** All pricing is in U.S. dollars. ***** Actual coverage may vary depending on the degree of pollution, space configuration and internal air flow. 1 Relative to Standard unit; Uses sorbent carbon fiber fabric instead of granular carbon. 2 Relative to Standard unit; Particulates removed by HEPA prior to air proceeding through sorbent media; Standard airflow passes through carbon first. 3 The free flow blower rate of the HM200 and HM400 without filters installed is 200 & 400 CFM, respectively. The delivered CFM listed on the chart represent expected CFM with filters installed based on conversations with the manufacturer. These products are intended solely to enhance general health and are not intended to diagnose, treat, cure or prevent any disease. Our Frequently Asked Questions (FAQ) will help you further compare our popular models. Are made overseas from plastic by the thousands. Contain low efficiency, inexpensive shaded pole motors which use lots of electricity*. Make claims which are truthful but misleading to the consumer about air cleaning ability. Are not forthright about the test methods used to rate their filter efficiencies. Generally contain superficial, cosmetic quantities of sorbent media to remove odors. *Compared to similar capacity machines with high efficiency PSC motors. NOT SURE WHAT TO DO?? More than you thought it would cost for quality products and protection of your health? STILL NOT SURE WHAT TO DO?? See the impact of poor air quality on health from a pathologist's perspective. What did you expect to find on this page, that you want us to consider adding? Note: If you would like a response, use the form found on the specifications page of the model of interest. Simply click on the photo or model number of interest above.